Coinciding with the arrival of the second generation Apple TV, Apple has posted a collection of support articles for the new device. In addition, Apple TV 2 owners are reporting an assortment of other troubleshooting and hacking-related findings. Here’s a roundup of the most notable of these initial reports. Although it shouldn’t happen often, your Apple TV may stop responding. The screen may go blank or pressing the remote control buttons will no longer have any effect. If this occurs, a reset typically gets things working again. To reset the Apple TV, as described in an Apple support article, press and hold the Menu and Down buttons on the remote control for six seconds, releasing the buttons when you see the LED light on the Apple TV flash rapidly. This may work even though the Apple TV is otherwise oblivious to remote input. If not, you can reset the Apple TV by unplugging it for 30 seconds. If a reset fails to get the Apple TV back on track, you may need to restore the device to its factory default settings. The fastest way to do this, as detailed in a second Apple support article, is to navigate to Settings -> General -> Reset on the Apple TV. From here, click Restore. But wait a minute! If your Apple TV isn’t responding to any input or you have a blank screen, you won’t be able to access the Restore button. What then? Here’s where things get really interesting. The second generation Apple TV contains a micro-USB port, which Apple describes as for “service and support.” The now-discontinued first generation Apple TV also included a USB port (the standard Type A). Apple similarly described the first-generation USB port as only for “service and diagnostics.” Apple never documented any end-user function for the port, noting that “a USB keyboard, mouse, hard drive, or any other device will not be recognized by Apple TV.” This was not entirely true. 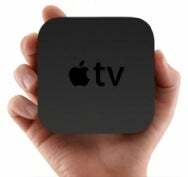 Hackers were able to get the Apple TV to recognize the content of an inserted flash drive and were thereby able to perform a number of unauthorized functions—such as enabling support for USB drives and installing Boxee software. You won’t be able to attach a flash drive to the micro-USB port on the new Apple TV. It’s the wrong type of port. However, you can go in the “reverse” direction: you can attach the Apple TV as a peripheral device to your Mac. This, at last, brings us back to the subject of restoring the Apple TV. If you disconnect the Apple TV from its power cord and connect the device to your Mac via USB, the Apple TV will appear in the Devices section of iTunes. 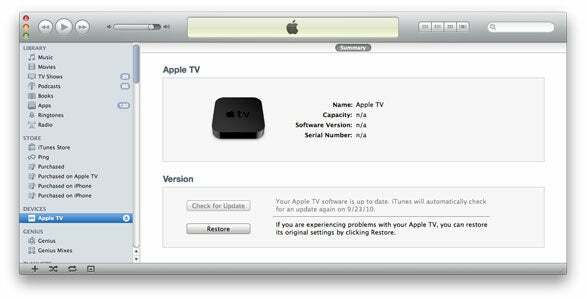 From here, you can select either to update the Apple TV software or restore the device to its original settings. Connect your Apple TV to a Mac via USB, and it will appear in the Devices section of iTunes, where you can update the software or restore the device to its original settings. This is almost exactly the same setup used to update and restore iPhones, iPads and iPods. The difference between the Apple TV versus these other devices is that update and restore are the only things you can do with an Apple TV in iTunes. There is no syncing of any sort—because there is no media storage on the new Apple TV; it is entirely dependent on streamed content. To access your iTunes media from an Apple TV, you need to set up Home Sharing (as explained in this Macworld review of the Apple TV). If, for some reason, after turning on Home Sharing, your iTunes content doesn’t show up on your Apple TV, an Apple support article offers a checklist of fixes to try. The suggestions are pretty standard fare: make sure you’re using the latest version of iTunes, check your firewall settings, and so on. But it’s worth checking out if you have a problem here. So far, Apple’s Discussion Boards have no threads (at least none that I could find) citing widespread serious problems with the new Apple TV. However, one notable thread, describing a “wobbly” or “wavy” picture on connected televisions, had at least a dozen or so confirmations. (You can see a video of the symptom here). As to why some people have the symptom but most others do not, one theory is that it primarily affects televisions connected to the Apple TV via HDMI-DVI. Apple apparently lists this as a “not supported” configuration, citing that the device is only “compatible with high-definition TVs with HDMI and capable of 720p 60/50Hz.” However, a few users had the same symptom even with an HDMI-HDMI connection. In any case, no work-around has yet been reported. Although Apple has not made any official statement on this subject, third-parties have confirmed that the new Apple TV is indeed an iOS device—exactly like an iPhone or an iPad. In fact, the iFixit Web site, in its teardown of the Apple TV, found the hardware to be remarkably similar to the iPad. Meanwhile, a TUAW article notes that the new Apple TV is running a custom version of iOS software, using an app called Lowtide to provide the Front Row-like user interface. Given that the Apple TV is an iOS device that can be connected to a Mac via USB, it is vulnerable to potential hacks and jailbreaks, as with any other iOS device. Efforts to jailbreak the Apple TV are already in the works.